After a year of successful collaboration, the partners of botSTEM project have managed to complete the first intellectual output of the project. IO1 is an online toolkit that contains good practices for integrating STEM activities in the classroom. It is now available at https://www.botstem.eu. One of the main purposes of the project is the development of an online platform based on Moodle, where teachers of pre-primary and primary schools will be able to form communities of practice. The main course page for teachers is organized in a multi-disciplinary way to emphasize the focus and knowledge of individual instructors. It is populated with additional links to useful resources such as files, tutorials, videos and activities. One of the main aspects of the main course is the forum, which allows teachers to communicate with members from the various partners, as well as form collaborations and offer peer support. 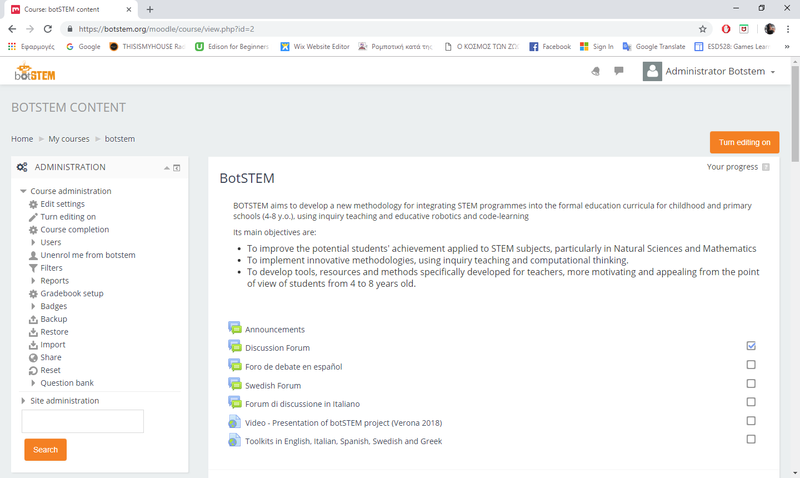 Interested teachers can visit the following link: https://botstem.org/moodle/. The platform is multilingual (all languages of EU member states) and teachers can register for an account using the login link.